What's fibreglass made out of? For the purposes of this article it is beneficial to understand a few basic facts concerning how fibreglass boats are constructed, their typical strengths and weaknesses and most importantly what are the visible signs that manifest themselves to the owner, such as stress cracks, de-lamination, osmosis and so forth. Briefly, most polyester resins are made up with glycol, organic acid and reactive diluents (styrene being one). When the catalyst is added, [MEKP usually] a chain reaction is initiated. The mixture forms a series of "cross-linking" reactions, which allows the styrene to create "bridges" which links together all the chemicals. The chain reactions run faster and faster until the glycol/acid chains begin to gel into a solid mass. Eventually, all these "cross-linked" bridges form a solid plastic mass holding the fibreglass cloth (or matrix) firmly in place. Heat is given off in this reaction as the chemicals cross-link together (Exothermic Reaction). Amazing isn't it? 1. The "female" mould is built to the required hull shape. 2. A waxy release agent is applied to the mould surface. 3. A "gel coat", which contains pigment (colour) of polyester resin, is first applied to the mould (10-25 mls thick). This provides the smooth coloured finish to the hull. 4. The "gel coat" is then backed by a thinner fibreglass cloth then several layers of heavier cloths are added to it to form the basic hull. The hull is then usually re-inforced with more layers of glass and resin onto areas that are under stress and the whole hull sealed with a final layer of clear resin. The rest of the internal fittings such as roof, decks, bulkheads and keel are added when the finished hull is released from the mould. (This does not always apply! Different builders vary this). Often in fibreglass hulls, wooden components have been used to reinforce areas, such as galleys and so on. Often, the wood is subject to water exposure and swells, eventually causing rot and decomposition. Many modern boats have been constructed using internal cores together with resins. These can be polyurethane foam, end grain balsa cores and many lightweight racing hulls are using various lightweight "honeycomb pattern" materials. These materials decrease the weight of the hull, often with very little strength loss. Also, the use of "closed cell" foam cores combined with epoxy resins has safe guarded many of these "composite constructions" from early failures but all must be subject to high quality and standards, especially where deck installations and fittings are concerned, due to repeated high loading. Just because the hull is underwater does not necessarily mean it will degrade any faster but in the case of poor maintenance, hidden factors may be at work. Lack of anti-fouling procedures allows marine growths to proliferate. Barnacles are a sure-fire gel coat killer if they are allowed to remain undisturbed at work! Naturally, a weed covered hull will hide the dreaded "osmosis blisters and underwater metal fittings will be subject to damage by galvanic electrical corrosion if the right conditions exist. Rudders and props, shafts too, are often overlooked when a hurried slipping takes place, usually for a quick anti-foul. A rudder repair I did recently involved complete decimation of the soft inner core by the dreaded 'teredo" worm. The rudder was sheathed in fibreglass and the worm had entered via a pinprick and chewed the living hell out of the core! Take nothing for granted! If you are contemplating the purchase of an older style fibreglass yacht, use a qualified marine surveyor. They, unlike you are fully trained and experienced to spot any areas that are defective or likely to cause trouble in the near future. If you skimp on these dollars, you've only got yourself to blame! There are many and varied forms of glassfibre cloths available from the simple "chopped strand mat" to the more exotic (and more expensive) Kevlar Aramids and Carbon Fibres. All these fibres offer different characteristics such as stiffness, strength and can be combined in use. Examples of these cloths are woven cloth; chopped strand mat (CSM) uni-directional, bi- and tri-axial stitched cloths. E-glass is probably the most commonly used for general repair work. Most of us are familiar with the way basic glass fibre and resins work. Separately, the glass cloth is soft, pliable and can be formed to almost any shape. The polyester resin (or any other, for that matter) is a clear sticky liquid that once mixed with the catalyst, (peroxide catalyst, usually MEKP) creates heat (an exothermic reaction) and eventually sets solid. Individually, the uses of these tow components are limited but when used together form a formidable alliance and produce a fibre re-inforced plastic (FRP). This incredible physical partnership enables huge stressed and loads to be transferred through the "cured" plastic and allow shells of immense load-bearing capacity to be constructed, i.e. boat hulls. Sadly, there is no such thing as a free lunch and although "fibreglass boats" have heralded a huge revolution of long lasting boat constructions, time has shown that fibreglass boats are not absolutely maintenance free. With years of use, boat hulls incur much wear and tear in the form of bending, flexing, fatigue, sudden impacts etc. The fatigue cycle can cause breakdown in the cross-linked "constructional chains" of the hull causing weakness, cracking and de-lamination of the glass impregnated cloths from the internal components. In addition to the physical deterioration of the glass/resin bond due to those mentioned, there are also some interesting chemical reactions, which conspire to cause breakdowns of the once solid "chains of strength". Often, a hull has been made in adverse conditions such as high humidity and if the fibreglass cloth has been subject to excessive damp, water contained therein will react to the polyester resin/glass mix to create a third unwanted "partner". This takes the form of a yellowish, highly acidic mixture which then attacks its own environment and seriously weakens the chemical "building blocks" of the resin and glass. This causes a downward spiraling chain of destruction that will spell disaster for the hull strength in time. This chemical and physical deterioration manifest itself in many and varied ways. High load stress areas, which are subject to high sudden impact loads such as handrails, stanchions, cleats etc, develop fine hairline cracks around the base. These, in turn, allow the ingress of external water. The pattern of destruction then is slowly but surely allowed to increase. Gel coat blisters can take the form of small "pimples" or bubbles. There may be one or two or even dozens. Often, when pricked, a smelly yellow acid substance will be found lurking within. This phenomenon is also called "osmosis". Caution: Do not allow this substance to get near your eyes! Wear goggles! A "hardspot" in the hull due to a stressed bulkhead or poor furniture installation can cause a "hardspot" that is visible in the form of a hard "line" in the hull. Often the gel-coat may be finely cracked (star cracks) around the area. In my opinion, this is the possibly worst scenario. Water has freely been absorbed by one or more of the previously described methods and the damage has increased by such a substantial amount that the glass cloth has completely separated from the resin and the area totally compromised. This can happen in areas that were originally starved of resin during construction, or even areas that have been 'squashed" by over zealous tightening of through-deck bolts. These areas will be soft to touch or will visibly flex when pushed and may be swollen with internal water. DECK HATCHES - These are subject to sudden, cyclic loads. Stress cracking followed by complete failure can occur. MAST/DECK FITTINGS - Cracks, warping, discoloration of gel-coat around the area (watch for chain plate areas). WINCHES, HAWSE PIPES - check for hairline cracks. POP RIVETED AREAS - check for leaks and squashing. FADING - Unfortunately, we have in our part of the world, some of the most intense Ultra-violet activity to be found anywhere and fibreglass pigmentation is extremely susceptible to it. Fading, especially of darker colors, is the result and although polishing can help, often the only solution is a complete repaint using two-pack or polyurethane paint systems. Having been half scared to death by the previous chapters; common sense must now prevail. What has been written may only partly occur or maybe never. 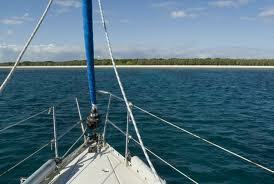 Much depends on the age, location and how your boat has been built and maintained. It is sheer folly to have never lifted a finger as far as maintenance goes and to expect your boat to be perfect. Amongst all the other marvels of modern day technology, sadly, we haven't invented the self -repairing boat! A regular maintenance schedule is strongly recommended and most, if not all, repairs can be effectively done by an average handyman provided you have obtained the correct instructional techniques. There is a wealth of information out there, much of it available from your glass and resin suppliers. So, turn off that telly and pick up that phone! Once again I stress, if you are in doubt about the condition of your own boat or one that you intend to purchase, don't guess, get yourself a Marine surveyor and let them do all the investigating, Its worth it, I can assure you! If you enjoyed this article you can find many more about boat construction and building your own boat if you visit the website that can be found in the resource box below. Terry Buddell is a freelance journalist and a Marine surveyor, boat designer and shipwright.